For a variety of reasons that I will save for another day, both kids are home this year, enrolled in a virtual charter school. So far it is working out well for all of us, and both kids seem to really be enjoying themselves with Caden having just signed up for an elective pen pal (okay so I called it “the people send you mail club”….minor detail) and Ryley starting Chinese I this week. Just a boy in the story, Caden. Just someone in the story, Caden. Anyway Johnny and Susie put their marbles together and now have how many marbles? Wait, I got marbles. Can I get my marbles? Why did they share marbles? I don’t know pal, it’s just a math problem. Do they get their marbles back? I have no idea if they ever got their marbles back, but I just about lost mine, so I had a few conversations with his teacher who gave us several suggestions to try. The first one was to substitute names that he knew into the story, but he wasn’t having any of that because he hadn’t seen person x who he knows give person y who he knows anything, and because we didn’t have documented proof, he wasn’t buying the story. Suggestion 2 included working his name into the story. Now he absolutely knew for a fact that he hadn’t given anyone marbles or Wii stars, or Mario figures, or crabby patties, or Pokemon cards (yep suggestion 3 was to substitute items that he knew and loved into the problem). Meanwhile, in therapy we have been working on the concept of minding your own business when conversations are happening around you. And thus the following…. So person X has 3 of something you care about and person y has 5 of something you care about and they put them together. How many things that you care about do these people that you know have? I thought maybe he was processing the problem so I gently probed, Caden what is your brain thinking about? Um…well we will worry about lunch after our problem. So how many do you think they have? They not talking to me so I mind my own brain. And with that, his teacher decided that for now we will just cut the word problems down to the math facts that he really needs to know for first grade and we’ll worry about the story portion later in life—I suspect she is hoping that that time comes sometime after he has another math teacher. Interestingly, she recently suggested that he can probably test out of 1st grade math—while we were assuming it was because he is so bored by the concepts/facts that they are learning now---I am starting to wonder if she just realized that it is only October and she’s already out of suggestions and is ready to hand the torch to the 2nd grade teacher a little early. Interestingly, she recently suggested that he can probably test out of 1stgrade math—while we were assuming it was because he is so bored by the concepts/facts that they are learning now---I am starting to wonder if she just realized that it is only October and she’s already out of suggestions and is ready to hand the torch to the 2nd grade teacher a little early. This summer we finally—after years of thought--- came to a major, huge, out of this world big decision for our family. We did a lot of research and then researched some more. We thought, we pondered, and then we researched some more. We talked to our children’s specialists and then thought, pondered, and researched a bit more. We also talked to the kids a lot to see what their feelings were, and then we’d bring up the conversation when they least expected it so that we were getting their most truthful reaction. After we came to our decision, we worried that the professionals in the field would take one look at our family and laugh. So we decided to send in our preliminary paperwork first, and once it was given the go ahead, we sent in our official application. That application was met with approval, so we contacted the second group of officials to see what they would say. When they also met our request with approval we decided to make our decision Facebook official by announcing that we are officially adopting from China. You might remember awhile back (http://specialhappens.com/2012/11/01/every-child-deserves-love-to-the-moon-back-adoption-awareness-month/) that we felt that international adoption was out of the question. And honestly, it was the way that we were envisioning it. We were thinking in the typical mom and dad travel manner. What we eventually realized is that like most things in life--autism, immune deficiencies, and so on--change what’s normal for us. With her infectious disease doctor’s approval, it looks as if Ryley will be able to travel with me (we’ll be taking every precaution under the sun and packing every major med you can imagine under the sun) while Dan stays home with Caden. It’s not the norm, but it is what’s going to work for us. There’s a lot of talk in the autism world about lack of empathy, and we certainly have experiences years on end of Caden not recognizing when others are sad or mad or even happy. We let the experts tell us that was his lack of empathy showing itself, and sadly I guess we believed that because we didn’t know differently. Over the last year, Caden has worked really hard with his therapists on learning to recognize emotions both that he is feeling and that others are feeling. He’s getting it in a big way; he doesn’t have degrees yet, so emotions are all or nothing, but those discretions will come with time. What we’ve learned is that Caden is incredibly empathetic; he just didn’t have the tools that he needed to demonstrate empathy. The best comparison I can make is claiming that a child can’t read who has never had the opportunity to learn letters and sounds; it is a huge leap to make and often an inaccurate one. Since learning that we are going to adopt, Caden talks a lot—actually fairly nonstop---about “the baby.” He has the usual boy or girl type questions, but he is also expressing a great deal of concern over what will make the baby happy. If the baby likes dark, maybe Ry Ry’s room would be best, but if the baby is afraid of the dark, he will share his nightlight in his room. He asked last night if the baby has been born yet and when I said I didn’t know he replied that he hoped the baby wasn’t scared. There’s a whole lot of awesomeness going on in that statement. First, he has recognized the existence of a child that he’s never met. Second, he is demonstrating that he really gets that his brother or sister isn’t going to show up in our family in the way that his friends have gotten their siblings. But maybe biggest of all, is that he is genuinely worried about this abstract person that he knows nothing about. He wants to save some of his Halloween candy and get a Christmas stocking to save presents for the baby to have once he or she gets here. He’s even been looking at his toys to see what he can share—did you read that—he is not only worried about this unknown being, he is also planning how and what he will share. I’m sure there are some ups and downs around the next corner. We are being approved for a special needs child and although we have specified what we think we are most comfortable with, I also know the universe has a child already in mind for us and we’ll add whatever stripes to our family that come our way. Eventually, the reality of sharing and having another sibling will rear its head, and there will be some interesting communication challenges to watch play out between our adopted child and Caden. There will be some autism specific hurdles and a few typical hey we are adding another person to our family struggles. 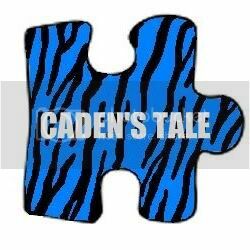 Good, bad, or funny though, it’ll just be another journey in Caden’s tale.